The service was good both ways and we were served a light meal of a sandwich and tea or coffee. We also enjoyed free soft and alcoholic drinks throughout the flight. There was a generous baggage allowance of 23kg – which was needed. The return flight was delayed by 3 hours due to early morning fog at Gatwick, which had a knock-on effect on our flight. The three hotels we stayed in are rated four stars, but in my opinion, the Sant Alphio Garden wasn’t of this standard. The hotel is situated in the commune of Giardini Naxos and needs updating as the rooms were quite basic. However, everything was clean and it had a nice outdoor pool area and a great spa. The hotel was very accommodating with our different dietary needs. It’s only a five-minute walk to the beach but the sand is grey and quite coarse. The Fiesta Athenee Palace is a much larger, busier hotel. The rooms were a higher standard and it had a lovely pool area with lots of sunbeds. The restaurant is buffet style with lots of choice but very busy and noisy. Also, it wasn’t very good if you have dietary needs as dishes weren’t labelled. The Una Palace was my favourite hotel, the setting for our last night in Sicily. The rooms were lovely with plenty of character and comfort. It has a rooftop terrace where you can dine and enjoy views of Mount Etna. We also looked around the Baia di Ulisse hotel near Agrigento. This was a lovely hotel set in a peaceful location and would be ideal for a relaxing break. It was beautifully decorated with lots of attention to detail including many beautiful vases and ornaments. 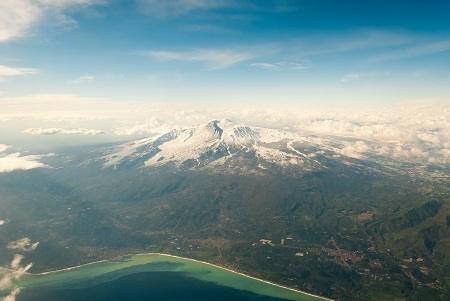 We visited Mount Etna – a must for any trip to Sicily. It took 1 hour and 15 minutes on the coach from Giardini Naxos to the slopes of Etna. We then took a cable car up to 2500m and enjoyed wonderful views. Afterwards, we travelled back down the windy roads to a local winery called Murgo. This was a lovely experience – tasting delicious wines in beautiful surroundings with some delicious bread, cheese and olives etc. We spent the afternoon in gorgeous Taormina, wandering the quaint streets and soaking up the atmosphere. We visited the impressive Greek theatre with a local guide. On another day, we visited Syracuse to take in the Greek and Roman amphitheatres and temples. Afterwards, the coach took us to Ortigia, an island not far away which has some amazing grand buildings and is another place full of character. We spent the morning admiring the ornate beautifully decorated cathedral at Monreale. It is adorned with intricate mosaics that had amazing detail. We walked around the streets of the old town, admiring some of the ancient buildings. The coach took us to the capital city of Palermo, just ten minutes away. We had a short walking tour which took us to the main points of interest and an amazing lunch at a local restaurant where they just kept bringing out more and more food. Walking back to our coach, we happened to see Paul Hollywood so, of course, we had to get a photo with him. On our final full day in Sicily, we visited Agrigento and met a local guide who took us around the Valley of the Temples. Here we saw some large impressive Greek structures and then drove to a farm set in beautiful grounds for a simple but tasty lunch. We were made very welcome and were shown how to make some delicious almonds in caramel. This would be a great location for a relaxing break for travellers who are looking for good food and who would like some cookery lessons. I really loved Taormina, exploring the lovely old streets and visiting the Temple there. Cefalu was another favourite; a beautiful town full of character. Another highlight was visiting the vineyard and enjoying the wine tasting experience in beautiful surroundings. Finally, I really loved the visit to the farm, where we had lunch and a cookery demonstration. If at all possible, it would be a good idea to include a bit more free time to relax or for people to explore at their own pace. 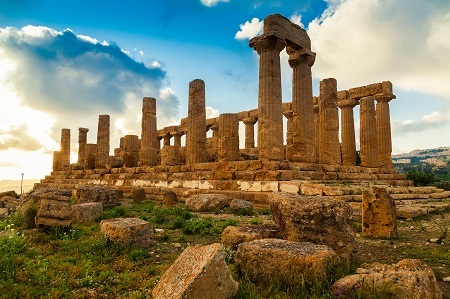 I would definitely recommend this trip to holidaymakers who want to see as much of Sicily as possible. It provides a good mix of history, visiting ancient sites, along with culinary experiences such as visiting Giracello, Murgo vineyards for wine tasting and the farm for lunch and a cookery demonstration. The trip can be tiring as it is action-packed with some long busy days, but on the plus side, you do get to experience a lot of Sicily. If you would like to experience the same trip that Melanie enjoyed, we have a one-off escorted tour taking place on the 4th April 2017. You will get the chance to taste local food and wine, try your hand in the kitchen and see the rich history of Sicily. For more information, drop by one of our travel agents in Essex, Norfolk, Suffolk or along the south coast.